Recently, a translator posted this story because it occurred to him, that in PNG, the act of watering your garden is non-existant. In almost every part of this country (except for a very few areas like the rain shadow area around Port Moresby, where they in fact have to import produce from the highlands) people have to make ditches, drains, and mounds in order to get rid of excess water. 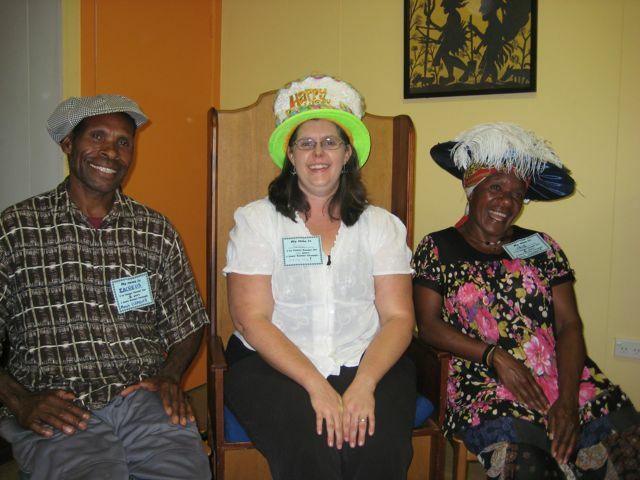 During the big El Niño drought of 1997, an Australian support worker at Ukarumpa advised her village friend whose garden was right by the river, to get a bucket of water from what was left of the river, and pour a bit of water at the base of each plant in her garden. The local woman responded with surprise - such a thought had never occurred to her! Here people don't water their garden because of the excessive rain. They plant something, and it just grows. But then again, in our home country, you don't burn away the tall grass (kunai) to make a place to plant. They till the soil by hand after burning away brush and chopping trees down. The place once called 'lone tree' (because it had a single tree on top of the hill) now has hundreds of trees. Things grow quickly and easily here. I thought it an interesting translation to culture dilemma. Whenever I hear 'I'm bored' from one of my kids, they get put to work. bored' they get one, mandatory. I took them outside and taught them how to change a flat tire. My son was very into it, my daughter, no so much. "Geez, I'm never going to say that again around dad." but say it again and see what happens!" Today during a break in recording, I was trying to find some common ground with the men I was working with. In conversation I realize they were from a beach area so I assumed they were fishermen. We began to talk about fish, their stories, my stories, and I decided to try and tell a joke. In the Bola language, Bakovi Dagi means 'God'. phrase several dozen times, in my earphones. "Bakovi Dagi, thank you for this day, for my wife, and kids....."
and didn't even realize what I had done until later. 1 - it's the Bible. 2 - People listening to this, and looking at the Bible, may in fact increase their reading ability so we want to be accurate with pronunciation. For this reason, I'm recording, checking levels, pausing, editing, restarting, etc,... AND scanning the Scripture in a foreign language for words that may have been skipped. Meanwhile one man sitting next to me.. Peter, checks to make sure pronunciation is accurate. It can look like a rather boring process... three men, in front of mic's... saying things like 'stop, start over, good job... pause...' and then being quite for long periods of time. If you were to watch me do it, you might think I spoke Bola. I don't. But I can read. Peter, has a heart for the Bola people getting God's Word, or he wouldn't be here. 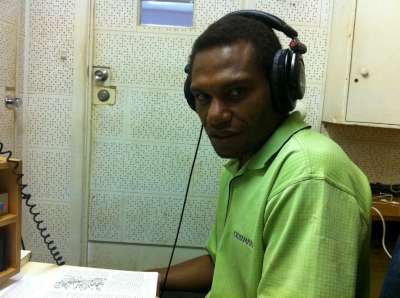 His home is way across the ocean on another island in West New Britain (Kimbu). He tends to get down on himself when he makes mistakes, but I remind him, that's why we have editing. When he makes mistakes, culturally, he becomes more shy, and thus more quiet. So for you audio geeks... imagine, that every couple of verses, I have to stop, and restart, and also check my levels, because the readers get shy when they make mistakes. You have to learn your reader. But if he doesn't make mistakes, he jumps up to -6 at times. I have to keep an eye on the mic gain. Pastor Benjamin, rarely makes mistakes, he reads at a high school level. However he is older and his voice gets tired more quickly, so we take breaks, and often only do 1 chapter at a time. Which means, I'm always checking levels, editing out long pauses, etc. So, what may look boring to the casual onlooker, is actually an adrenaline filled, constantly vigilant, always looking at things, trying not to tweak or make changes but reacting when I need to.... high energy process. Which is why when I get home, all I want to do is sleep. People ask me 'why are you so tired'. her family and then with the ladies' fellowship group in her village. Susan was trying to put herself forward, to make a name for herself. They were literate and Susan was not so she should keep to her place. sermon based on the message contained in the story she just told. most unlikely person to deliver it. Every two years we have an odd event. Hundreds of missionaries gather to discuss weighty things, strategies, policies, etc, on how we will minister in PNG for the following 2 years. As a result, there is stress, which means, laughter is good medicine. This year, I did not have time to rehearse a complicated banjo number, so I decided to do more of a comedy act with my banjo as the main prop. Sadly, the video and audio is actually well done, and yet, I don't really play banjo so much as strum around for effect. One of my side-ministries is trying to do things that help people 'STAY'. To increase their longevity, it is important to, from time to time, laugh. So I wrote this comedy act, with a friend, to get a lot of laughs. Some of the jokes are impromptu, and some are written but not rehearsed. Please excuse the poor mic'ing of the event. I tried to make it easier on our sound techs by sharing a mic, but the end result is that I had to do a lot of leaning and looking back and forth. Like I said, very very little time or rehearsal went into this. The laughter you hear, is 300 or so non-profit volunteers from all over the country, who know me, and my guest, Andrew. It'll be funnier for them. Hopefullly in 2 more years I'll be able to post a more serious banjo piece but, in reality, I can't take myself that seriously... after all, I play the Banjo. (still 2 years ago, my dueling banjos between me and my laptop was something to see). And before you get all 'this is what he spends his time doing?' remember, I spent very little time preparing this number... and also, yes. I do spend some portion of my time encouraging others in creative ways. you do that has eternal significance?'. Today was a banner day. -I trained a translator how to record audio Scripture. Audio Bibles went through our doors into the hands of PNGians. That's a Lot of Bibles!!! to work. I got to put Scripture on all of those! Sometimes we get requests that have us write a blurb or a photo. This month we've had 2 or three 'flat stanley' requests... we've done those for kids in school, because it helps them see the world as BIGGER than the one they live in. We have gotten pen-pal requests from kids in Awana programs who are required to speak to missionaries, or who want to know more from our kids. Chad works at several jobs. He is currently spending 12% of his time as a network engineer with CTS, 50% as the E.C. Secretary and 38% of his time doing Scripture Use Media. Recording Tok Ples scriptures so that the people of PNG can hear God's Word in their own language is very important to him. 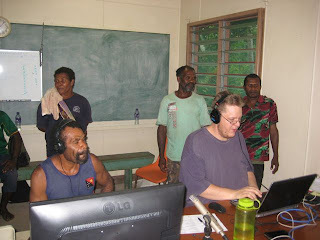 Sometimes he travels to the village to get the recordings done, and sometimes he edits the recordings at his office back in Ukarumpa. Audio recordings help some people in PNG who can't read, to hear the Word of God in their heart language. in advance put it on my calendar to 'renew passports for the kids'. sited! show up next thursday at 3pm." years ago and I had a slew of paper work to fill out and copy, etc etc..
copied, applications filled out, etc.. before 3pm today. taken and printed, we got in the door moment before they closed! orderly, we'll still get 2 passports renewed for the kids. 2 - to get the passport renewed before the visas get printed. of Papua New Guineans who either can't, or prefer not to, read. 7 - the Audio player has to be charged (power), and the SD card has to be put into it, tested, and then a small plastic door has to be screwed into place to prevent SD card theft. 4,5,6,7 all relatively short periods of time. But.. step 6, can take a LONG time. The way we WERE doing it, until today, was to have a 10 port USB hub, on a linux machine running a script that would copy files from a CIFS share. It took 15 minutes for every 10 SD cards and it was a huge pain to put them into those USB to MicroSD adaptors, plus the Linux script would fail and we wouldn't know which card was the issue... etc. So, I proposed we purchase an SD card replicator. It was an idea that another technician had as well, but he hadn't the time to pursue it. We got it yesterday, a translator came in an said 'we have to get 96 Audio Bibles into the village by May 4'. It was time to use our new replicator. WOW is this easy and fast. It takes 2 minutes to do 15 with NO errors and NO hassle now. No USB adaptors, it is soooo amazingly simple and fast. We're on cloud 9. Today we may actually get a lot of Audio Bibles into the hands of PNGians, faster and easier than we ever have before! I'm pretty excited about that, as I'm constantly trying to find ways to improve our productivity. Doing MORE with LESS is preferred over doing LESS with LESS but that's the reality of our situation. We have 1 technician here (me) for the time being... so tools like this, are super helpful! 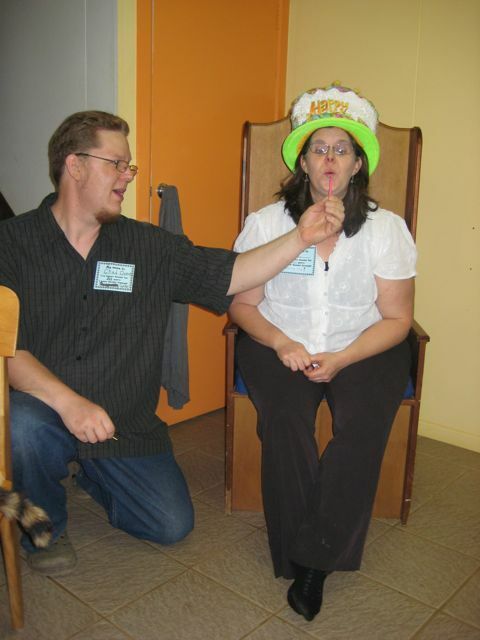 -executed a 40th birthday party for my wife. The woman I love turned 40 this week. Tonight we celebrated her. since she has a cold. my life easier, but also to invoke the feminine element to the party. I hired an industrious high school student to wait tables and wash dishes. I asked people to bring a dish to share, and made the party potluck. Which, here, is a very acceptable thing, and the food was GREAT!. I built a playlist for mood, starring a lot of popular songs from 'our era'. we had 45 people, from all over the world. we sat and shared a meal together, and played an awesome mixer game. something about Kendal. The game got hilariously crazy. her cake, and posed for pictures, etc. but I humble myself this way to honor her in public in front of her friends. The other day I stood up in front of over 400 people as they asked me questions before they eventually voted me is as the Executive Committee Secretary. The question asked was "how do you cope with stress?" Today was a crunch day. It was one of those days when the weight of the world is trying to crush you. Sure I could write out all the things going on, but it's enough to know that it wasn't a great morning. On top of all that stress, nothing was working right. Even the computer mouse was failing. One of the major things, is that because of my new responsibilities, I now had only 6 days to do 2.5 months worth of work. I had to finish post producing Genesis, Luke and Acts. I got 12 chapters into Luke, I was on a roll, when I realized, I was working from the wrong source files and had to scrap all of my work. STRESS + WASTED TIME = not a good mood for Chad. I did some of the things on my list at lunch time. Definitely prayed! After I got back from lunch I learned a new answer to 'how I deal with stress'. Being productive is the best thing for stress. Completing things, getting them done, getting them OFF your plate, is hugely helpful. Not only did I finish a ton of paperwork I'd been unable to get to. I posted Genesis, and 98% of Luke, in only 4 hours. That drastically alleviated my 6 day crunch, so now I can proceed with much less stress. 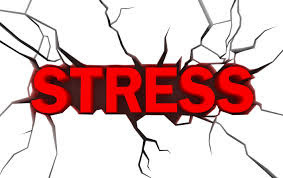 Sometimes, the way I handle stress.... is I work. I don't work like a work-aholic, I just narrow my focus, tune the world out, and go at it, until it's done.